Movies, TV shows, and music are finally coming to Google TV via Google Play beginning today. Google TV users will now be able to make purchases and rentals through the Google Play Store, which will then be synced to your Google TV for viewing from the comfort of your couch. The latest figures report that Google has over 100,000 titles available in the Google Play Store from deals with all six major film studios as well as other independent labels. The latest deal brought 20th Century Fox on board and added 600 additional titles including new releases to the marketplace. 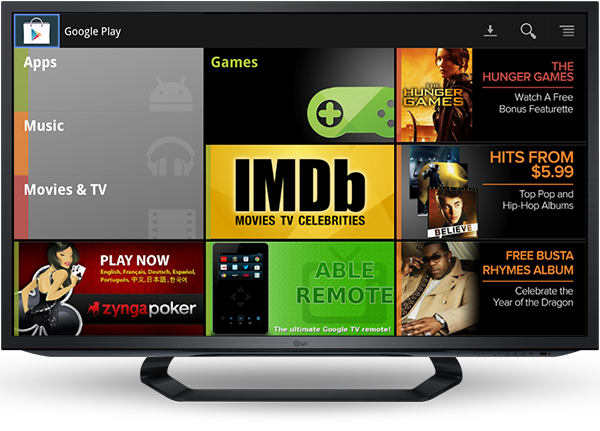 Purchases or other content that you’ve had access to on your mobile devices will now also be available on Google TV. Whether you’re using the Google TV service through set top boxes or a Google TV integrated TV set, you can find new content from the Google TV & Movies app. The app includes a recommendation feature that will suggest shows from Google Play and even from its competitors including Amazon and Netflix. “Google Play gives you one place to find, enjoy, and share your favorite entertainment with millions of songs and thousands of movies and TV shows for sale, and adds to the millions of entertainment options available for you on Google TV through YouTube, TV & Movies, Search, and the full web through Chrome,” Google said in a blog post today. Developers will have an extra bonus that comes out of the update, and will now be able to add auto-updates, subscription billing, and smart app updates to their apps on the Google Play Store. Updates aside, Google TV hasn’t been as successful of a platform as the company had initially expected it to be. The adoption rate for Google TV devices has been dismal and hardware manufacturers have been taking hits as a result. In February, AllThingsD reported that fewer than 1 million Google TV devices were in use today. Even if that figure has doubled by this month, it’s still a dismal number for manufacturers like Logitech that invested in Google TV with the development and release of the Revue Google TV set-top box last year. At the same time, Google’s TV & Movies app hasn’t been a favorite among users as they’ve been complaining about bugs and its limited geographic availability and features. Although the much awaited update enabling purchases and rentals on the Google Play Store on Google TV devices is one step in the right direction, there are plenty of obstacles left for Google to overcome in its attempt to corner the living room.